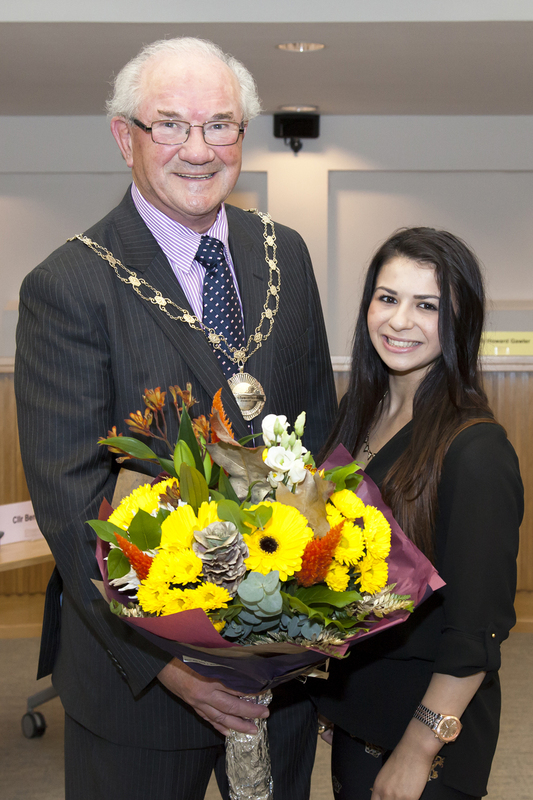 South Gloucestershire’s talented gymnast Claudia Fragapane attended a civic reception in Kingswood last night (Wednesday 15 October) to celebrate her achievements at the Commonwealth Games. Claudia, 16, from Longwell Green, has just returned from competing in China. Last night she was welcomed to the council chamber by Chairman Cllr Howard Gawler who presented her with flowers and a shopping voucher in recognition of her four gold medals at the games in Glasgow this summer. Cllr Gawler said: “I would like to congratulate Claudia on behalf of South Gloucestershire Council and the people of South Gloucestershire, on her wonderful success at the Commonwealth Games. “In winning four gold medals, Claudia is in the record books as being the most successful English woman at the Commonwealth Games for 84 years. “Claudia, who is from Longwell Green, started gymnastics at the age of six and now trains at the Bristol Hawks Gymnastics Club in Bristol. Since taking up the sport she has gone from strength to strength and has excelled at many disciplines including the vault and floor exercises. Her achievements have been widely celebrated in the media and she has even picked up the nickname of the ‘Pocket Rocket’.